Here's a skillet mac & cheese with a twist - CHEEZ WHIZ and shredded cheddar team up to create a rich and creamy mac & cheese - a surefire family-pleaser. COMBINE 2 cups each water and macaroni, in an ovenproof skillet. BRING to a boil and cook, stirring occasionally, until most of the liquid is absorbed (about 10-15 minutes); add Cheez Whiz Spread (a few spoonfuls per person) and return to low heat for a few minutes. 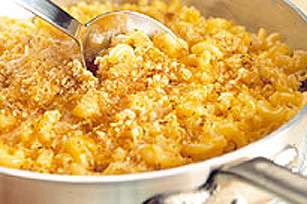 REMOVE from heat and top with a few handfuls each of bread crumbs and Kraft Double Cheddar Shredded Cheese. Broil in pre-heated oven until cheese is melted.